Born in Italy, the young Louis Alinosi, armed with energy, motivation, a flair for business and a dream of owning his own restaurant, moved to Detroit in 1911. Joined by his brother, Joseph, they worked together to bring that dream to fruition. In 1921, the doors of their ice cream parlor and bakery opened on Mack Avenue and Grand Boulevard. Within a few years, seven franchised parlors bearing the name Alinosi Ice Cream and Candy Company served Detroit families. By 1942, Louis was able to acquire the Dexter Dairy Company at McNichols and Goulburn. The location soon became the local community center where Louis, his wife, Marie and daughters, Diane and Nancy would magically delight thousands of eager and loyal patrons and Louis remained active in the business until his death in 1969. Faced with the hardship of business and a declining economy, only the McNichols store remained open. His wife, Marie, died in 1990, at which time grandson, Steve DiMaggio, assumed control of the business. Steve, armed with the same energy, motivation and determination as his grandfather, was soon able to franchise new parlors in Grosse Pointe Woods and Roseville. Now, future plans are in place to reopen other ice cream parlors in the city. 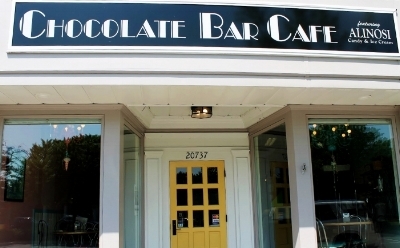 Chocolate Bar Cafe is now owned and operated by Lisa Corbin. Lisa works diligently to provide the best customer service, maintain the best quality product, and keep the cafe running in the same fashion as when it originally opened 90 years ago. All the while, Lisa provides a new twist with her delicious cakes and pastries!